Murray Boltinoff in the 1970s. Photo by Jack Adler. A graduate of New York University, in 1933 Boltinoff was hired as an assistant editor at the New York American—the first newspaper to hire his younger brother Henry Boltinoff as a cartoonist. Although Craig Yoe has stated that "Murray had got Henry [the] job", Don Markstein reported that it was actually more difficult for Henry to sell artwork to Murray, as "both [strove] to avoid any appearance of favoritism". Henry Boltinoff subsequently began selling cartoons to Whitney Ellsworth at National Allied Publications, and suggested that Ellsworth hire Murray as an assistant, which Ellsworth did around the year 1940. As an editor, he oversaw the creation of the Doom Patrol in My Greatest Adventure, and came up with their tagline, "The World's Strangest Heroes". When the Doom Patrol series was cancelled in 1968, Boltinoff and artist Bruno Premiani appeared in the story to urge readers to keep the series alive. Boltinoff revived Metamorpho as the backup feature in World's Finest Comics #218–220 and #229 after the character had a brief run as the backup in Action Comics #413–418. Gina Misiroglu has described Boltinoff as Metamorpho's "savior" from post-cancellation obscurity due to his "tendency to stick [Metamorpho] into whichever comic [Boltinoff] happened to be working on at the time." The character's creator Bob Haney later reported having read an interview in which Boltinoff claimed to have created Metamorpho, and attributed this to senility on Boltinoff's part. Haney was not the only one to comment on Boltinoff's memory: Superboy and the Legion of Super-Heroes writer Jim Shooter recounted that Boltinoff "would forget the character's [super-]powers" and "seemed to have early stage Alzheimer’s. Seriously. Ask his former assistant, Jack Harris. Murray would give me instructions, forget what he’d said, then be upset that I hadn’t followed some orders he’d never given me. I ended up doing rewrites because Murray misremembered things." While editing Superboy and the Legion of Super-Heroes, his actions included rejecting Dave Cockrum's proposal for a new character on the grounds that the character was "too weird looking" (Cockrum later repurposed the character as Nightcrawler),  and hiring Mike Grell as artist. Grell subsequently described his conflict with Boltinoff over the lack of racial diversity in the Legion's 30th-century setting, noting that Boltinoff had forbidden him from representing a corrupt police officer (in Superboy #207's "The Rookie Who Betrayed the Legion") as that setting's first black character, on the grounds that "'You can't do that because there's something negative in that character.' (...) Murray felt that would make the character appear weak" and "we've never had a black person in the Legion of Super-Heroes, and now you're gonna have one in there who's not perfect"; Boltinoff also promised Grell that a black character was forthcoming and, in Superboy #216, Tyroc was introduced. 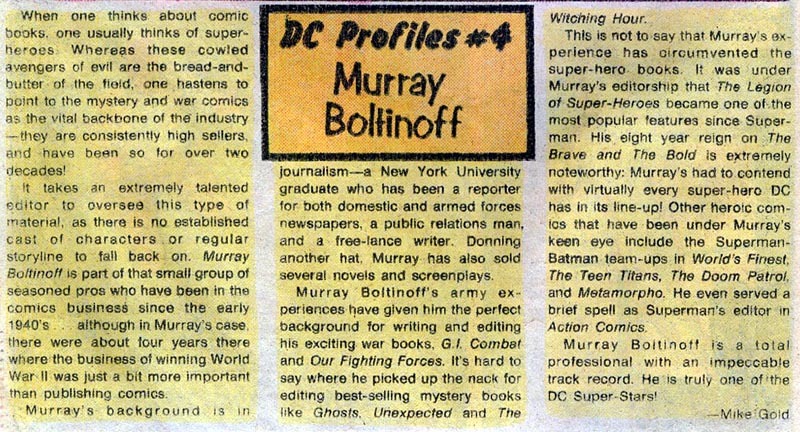 Murray Boltinoff retired from the comics industry in 1988. His final editing credit was Sgt. Rock #422 (July 1988). ^ Bails, Jerry; Snyder, Robin (2006). "Boltinoff, Murray". Who's Who of American Comics Books 1928-1999. Archived from the original on February 21, 2014. Retrieved September 20, 2013. ^ Yoe, Craig (2007). Clean Cartoonists' Dirty Drawings. San Francisco, California: Last Gasp. ISBN 978-0867196535. ^ Markstein, Don (2002). "Henry Boltinoff". Don Markstein's Toonopedia. Archived from the original on October 11, 2014. Retrieved September 20, 2013. ^ Klein, Todd (July 9, 2013). "The DC Comics Offices 1930s-1950s Part 2". KleinLetters.com. Archived from the original on September 21, 2013. Retrieved September 20, 2013. ^ Chen, Ken (Summer 2008). "Doom Patrol, Volumes 1-6". Rain Taxi. Archived from the original on September 21, 2013. Retrieved September 20, 2013. ^ Misiroglu, Gina (2005). The Superhero Book: The Ultimate Encyclopedia of Comic-Book Icons and Hollywood Heroes. Detroit, Michigan: Omnigraphics, Inc. ISBN 978-0780807723. ^ Catron, Michael (2006). "Bob Haney Interviewed by Michael Catron Part Four (of Five)". The Comics Journal. Seattle, Washington: Fantagraphics Books (276 and 278). Archived from the original on January 9, 2014. Retrieved September 20, 2013. ^ Arndt, Richard J. (January 2016). ""The Kid Who Wrote Comic Books" Speaks Out! Jim Shooter On His First Decade In The Biz - And Then Some!" (PDF). Alter Ego. Raleigh, North Carolina: TwoMorrows Publishing. 3 (137): 19. Archived (PDF) from the original on July 8, 2018. ^ Vaughn, J. C. (June 2009). "Jim Shooter's First Day at Marvel Comics". Back Issue!. Raleigh, North Carolina: TwoMorrows Publishing (34): 14–19. ^ Cronin, Brian (July 20, 2006). "Comic Book Urban Legends Revealed #60". Comic Book Resources. Archived from the original on August 21, 2014. ^ Chan, Suzette (December 10, 2012). "Adapting Arrow / Mike Grell". Sequential Tart. Archived from the original on September 24, 2015. Retrieved September 20, 2013. ^ a b Sacks, Jason; Dallas, Keith; Dykema, Dave (2014). "Chapter Seven: 1976 Bicentennial Fireworks". American Comic Book Chronicles: The 1970s. Raleigh, North Carolina: TwoMorrows Publishing. p. 192. ISBN 978-1605490564. excerpting Cadigan, Glen (2003). The Legion Companion. Raleigh, North Carolina: TwoMorrows Publishing. This page was last edited on 19 January 2019, at 08:17 (UTC).